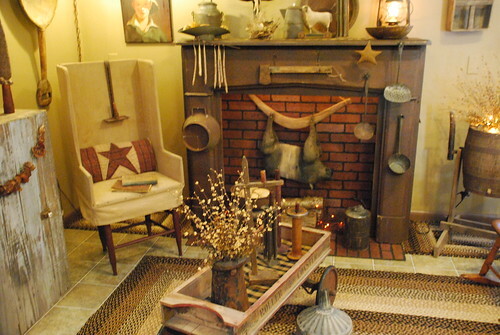 The first question about Primitive Decorating is how it’s different from “Rustic decorating?” Primitive should be a sub-category of Rustic, along with Shabby-Chic and Farmhouse and more. Rustic for us is mid nineteenth-century to the modern urbanization period when we left the farms. Primitive goes back even further, to the founding of America and the colonial period or the settling of the American West. It also evokes images of old European farm houses or simple country dwellings that lack modern day conveniences. (So be sure to hide the Wi-Fi router in a wicker basket with a lid!) There’s no need to shut off running water to your home; adding an old pitcher and basin to the sideboard will give your visitors a similar visual cue! This style of decorating might be best suited for the cottage in your back yard or the second or vacation home. Or make it seasonal – roll it out for the Fall and Thanksgiving. Accessories: Gather items with an eye towards utility. Furniture: Stick with wood, rattan/wicker, leather and stone. Rubbed oil or antiqued finishes on the hardware are a great way to set the tone. Look for wrought iron items and finishes, such as fireplace sets, light options, or even wall art. If you really want to go deep into the Primitive Decorating theme, and have the time and budget, consider alterations to the walls, floors and or ceilings. Real wood or boxed (fake) beams at the ceiling will go a long way. Even just one along an accent wall in the corner is easy and makes a good starting backdrop. A little easier is wood planking on an accent wall, ceiling, or simple baseboards made of recycled wood. Make those baseboards large (tall) and with a square edge at the top (none of that fancy millwork for the primitives!). And if you’re decorating the living room and if it has a fireplace, consider a massive rustic beam for the mantle, and more stone or brick around the firebox. The stone can be put on as veneer. Check the resources box for more. Painting is a happy middle ground between all-out wood work and simple knick-knacks on the flat surfaces. 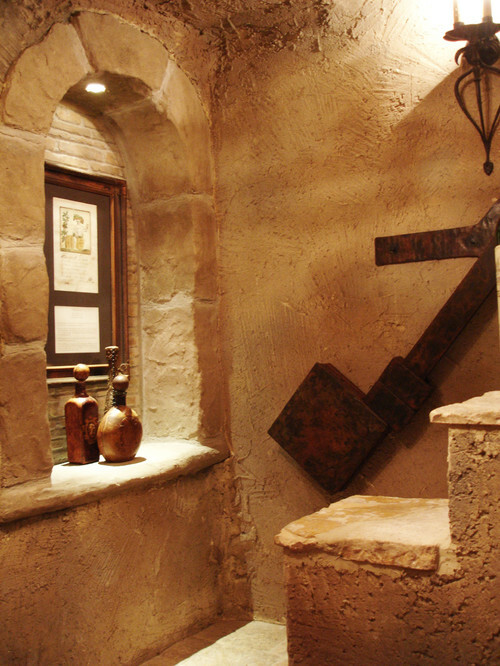 Use earth tones to evoke the early days of mud and stone walls. Another effect is to create a matted stone-like finish in the paint on one or more walls. Use this texture in your paint for an easy (easier?) way to create primitive walls. From the ground up lets look at rugs, and find stuff with real texture. Sisal, Jute and natural fibers are the key. Here is a good starting point for the room in Jute. Then throw an antique spinning wheel or hand butter churner in the corner, and make liberal use of old blankets or quilts. Have access to square-cut tree stumps (so they stand up straight)? Or other larger size beams, cut the the size of stools or footrests. Clean them well & bring them inside. Coat with varnish or simple wood oil for a more polished look. Bottom line: Primitive decor is easy if you have the older home for it and just need to paint and fit in the furniture and accessories. If you need to make some alterations for that true primitive look, it will be a larger investment of time and materials. Vintage Decorating Ideas Rustic Decorating Ideas 3 Critical Things in a DIY Home Décor Makeover 50 Shades of…Wall Art!